Big hug! I felt a lot like this all last year, especially with the teachers. In fact, most days I DO eat lunch alone in my room because the drama and cliques and gossip of the faculty room wear me out. The first few weeks will be the hardest but then they will realize how great you are! I think a lot of people assume new teacher means bad teacher so they're giving you a run for your money. It'll turn out fine! I feel kinda the same at my new job! When I was doing my leadership clinicals, I knew all the staff of my floor I was on, knew my way around the hospital and knew what was expected of me and the policies and procedures to follow. Now, I'm like a fish out of water. As a new grad, I'm actually an "intern II" and most of the other intern IIs come from another nursing school, meaning they all know each other which leaves me sitting by myself. It's lonely and I'm not used to it and I don't like it. I'm hoping it changes soon. Hang on. At least you didn`t go as M. Pfeifer in Dangerous minds :) Maybe that`s their way to try you out. If you fall in their tricks, they`ll be even more cruel. I just can`t imagine that it`ll take them much to get to like YOU. Whoa! He actually put that in a note?! If only spanking was still allowed for teachers! Don't let them crush your spirit! Bonnie, hang in there! I for one know what it's like to have to start over and be new all the time! It is NOT fun! But you will grow and learn so much this year. Like you said yourself, you have to give it time! I had a horrible experience when I moved to TN and taught in their system too. I think it was worse than yours though... pretty sure about that one. But, hold your head up high and keep plugging along with your students. You have to earn their respect, earn their trust. They are testing you right now big time. It doesn't help that you are young looking and pretty and a female, they have their doubts about you. But in time you will show them just how competent of a teacher you are. Don't lose your cool. I had some really bad students who, when I resigned ten weeks later were seriously upset that I was leaving. You will win their hearts soon enough! And you will make friends with the faculty, you're just new. Oh man, do I know how it feels. Every freakin' time we move. I love you! Bonnie, I miss our lunch group so much too! You have no idea! Stephanie wants to go out to ice cream with both of us sometime in the next week or two and catch up. Awe, I miss you, girl! I totally feel your pain. I have some similar stories to tell you. Things are going to look up, though. Hugs! this too shall pass, it will get better and you will be blogging about how much you like your new school in no time. there is a reason you are at your new school; don't forget that. This sounds really stressful. I hope you can find your groove soon! I feel like I know exactly where you're coming from, but the sad part is, I've been at this school for a while now! No one took the time to know me when I was just an assistant, which is fine. But now that I'm in my 2nd year as a librarian, they have warmed up to me, but I still feel like such an outsider. I mean.. we had 3 days of staff development, and we got an hour for lunch. Every. single. teacher. left in groups without me. At first, I thought it was a fluke, but on the third day, I realized I wasn't even on their radar. And this is a staff of 30 teachers. After a while, I just had to remind myself.. I didn't do this to bond with teachers. I did it to work with a bunch of teenagers looking for their place in this world. And maybe, just MAYBE, somewhere in there, you and I will be noticed. We will no longer be the outsider. Until then, we just have to take a few hits to our self esteem and just KNOW we're going to survive. Pretty soon, those kids are going to realize just how fantastic you are, and it's going to be amazing. Aww hun, im sure it will get better with time. Im sure once this week is over, it will be all down hill. 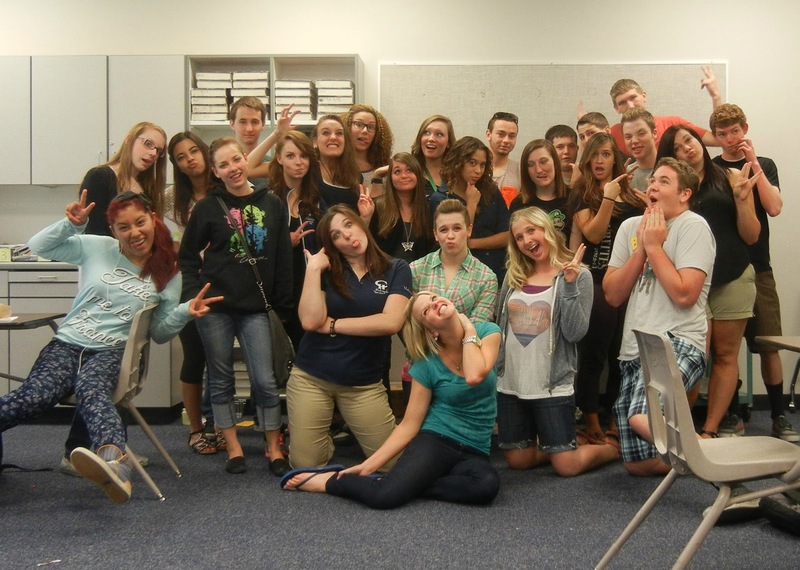 I can't imagine how homesick it would feel to teach at a school that wasn't Bingham. But at the same time, the teachers there were really clicky and I only talked to the other FACS teachers for three years until I started doing Student Gov and then a couple English teachers and a history teacher were friends with me because they had to work with me! So I spent a lot of lunches eating at my desk, grading papers and watching Hulu. I didn't mind, it was nice to have some alone time after being with 180 kids all day. And that stupid kid said you could learn a thing or two from his last English teacher???? He doesn't even know you! He'll come around. That's them older kids for you. We can't take it personally. PS I'm new at a school this year too. We can do it! I'm not a teacher & have the utmost respect for all teachers because there's no way I could handle that many teenagers in one setting. I hope you know, that no matter what those kids say to you & act like to you, you are still making a HUGE difference in their lives. They will remember when they go off to college the awesome teacher that loved The Great Gatsby & had fun teaching them all about English! Stay strong and remember, you're an amazing teacher, they just haven't figured that out yet! I'm sure it's tough! You're strong though and you will make it through the tough parts and learn to love it. You always have such great attitude about things so give it time. I'm not much help, but I know you'll make an impact in these kids lives. Good luck! I want to give you a hug! I'm going to be leaving my church in a few months... and I'm going to miss my kids like crazy! I saw one of my seniors last night (known here since she was 12!) and I could feel my heart strings tugging because I know I'm going to miss her a ton once I leave. Your new students will see how awesome you are in time though. Lots of love! aww it is hard being the new kid. next year people are going to be fighting to be in your class though. are you doing anything fun the first couple weeks to makea splash? I have been at my current school for 11 years. This year feels so different (and not in a good way). The students are totally disrespectful and there is pressure coming from all directions. Teaching is SO tough these days! Oh no! So sorry that you're having a rough start at your new school! I had a similar experience when I first started teaching. A student actually said out loud in class on the first day, "Man, I can really tell that this class is going to interesting this year. You have no idea." All in sarcasm of course. A month later, the entire class tried to plan a paper ball throwing incident where they simultaneously threw paper balls at me. Nothing hit me, thank goodness, or I would have wigged out even more than I did. However, after I totally freaked out on them (full on screaming at the top of my lungs, totally cleared off everything from my desk if one fell swoop, threw a pen at the cabinets, etc) we were good for the rest of eternity. It was a love and respect them, but with tough love and no excuses type thing. They actually loved me so much that when I decided to loop with them and move up a grade level to stay with them the next year, they cheered. Point is, sometimes it takes that first month to get settled, for them to see how much fun your class can be. And they always seem to have to test the new teachers. Has happened to every teacher that came into our school and I remember students doing the same when I was in school. Keep your head up! You're obviously an amazing teacher that cares a lot about what you do. And I'm absolutely sure things will get better and that your students will eventually come around. Oh Bon, I'm sorry. If it makes you feel any better I kind of remember torturing any new teachers at my school for the first week or so. Ok not me personally...but I know it happened :) Give it some time, and I'm sure you'll find a few gems of students in all that gunk! Aww sorry its not going so well for you. Hope it gets better soon! Sorry it's not working out for you at your new school. I usually avoid my teachers lounge as well because of clicky people. I find it nice to actually have 30 minutes of peace and quiet from kids. I do plan a lunch with one of the few co-workers that I am close to, about once a week. Nobody ever reacts well to change--and if somebody tries to tell you they love change, then that person is lying. It will just take time for everyone to get used to you in their school (not easy for impatient people like us), and it will take time for the teachers to warm up to you. You're totally right, people forget what it is like to be new, and so they don't always make that extra effort to welcome a new person. Don't worry, they'll come around! In the meantime, yes, watch lots of episodes of the Kardashians, because their train wreck of a life will definitely make you feel better about yours! Hang in there! Teaching is one of the cliquiest professions around, in my opinion. I encountered some seriously nasty teachers when I was teaching, especially at the preschool level - one of the lead teachers was 19 years old and a total mean girl. I'm sorry you are having a hard time. I had no idea teachers would be clique-ish like that! I guess it's like that everywhere though because as a nurse I know that we can also be that way. If only they could automatically know how awesome and witty you are! Sending hugs and positive thoughts your way! We love you and when the time is right, COME BACK TO US! In the meantime, you always make an amazing impression on people and they love you automatically - well, some might be a little slow - You will steal hearts and earn respect! So sorry to hear about your bad experience at your new school!! What a jerk that kid is! I'm sure you're an outstanding english teacher and you're going to prove him wrong! He's going to realize that the other dude can learn something from you! Keep your head high! Good luck friend! I feel your pain! I'm at a new school this year too. ugh, I just want to cry with you! My husband and I just moved into a new ward (in the same town), and it's been the hardest adjustment for me. I feel like I know I can be pretty cool, but no one else does! I even got the exact.same.calling. But it feels so different. Change is hard. I'm sorry you're having a rough time--I hope your students don't take long to realize how awesome you are! You address the job application correspondence with an corporation in which you are looking for the task.